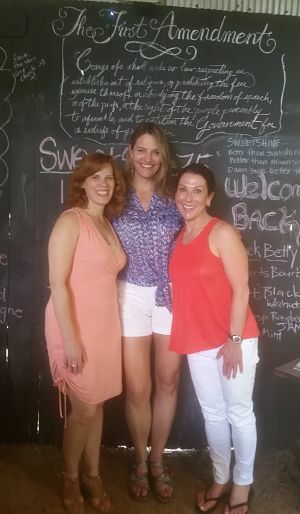 Enjoying the moonshine with two friends at Bloomery Plantation. This week I’ve devoted every day of my blog to a wine-related post. Or something close. I’m celebrating a birthday soon so it seems proper to have a toast. In honor of the big day, every post this week will discuss something about wine or some other beverage (like moonshine) worthy of being poured into a glass and raised during a toast. This past weekend I sampled moonshine (or sweetshine, as they call it) at Bloomery Plantation in West Virginia. I spend a lot of time working, so maybe it’s no surprise that I tend to learn about the world through my auctions. Where did I learn about Bloomery Plantation? At a fundraising auction. Where did I find the architect drawing up my bathroom plans? At a fundraising auction. Where did I find the landscape architect helping me navigate major drainage issues at my house? At a fundraising auction. Where did I get all of my esoteric knowledge about Pappy Van Winkle? At a fundraising auction. Closed. But not for long. So I met the team from Bloomery Plantation at an auction in spring 2014 and have visited their facility three times. The second time (February 2015), I took my friend Caroline. Unbeknownst to us, the place had closed hours before, due to some archaic West Virginia law. Thanks to a groundswell of Facebook fan support and considerable work on behalf of the distillery’s management team, the law was changed a few weeks later. 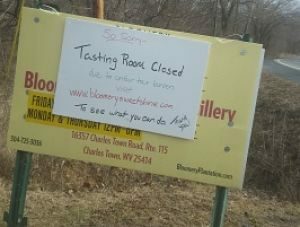 The tasting room resumed business. As the red head didn’t get to sample her sweetshine in February, we (and a third friend) traveled back this weekend. I bought two of their flavors: Cremma Lemon and Chocolate Raspberry. Yesterday, I opted to try the “funtenders” (Not bartenders. Funtenders.) 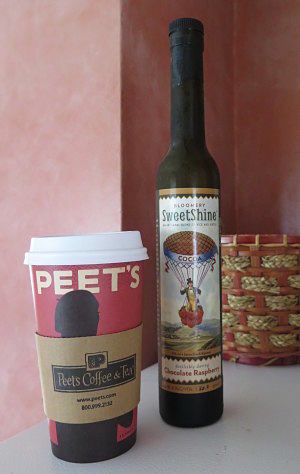 recommendation and put a shot of the Ghirardelli-based sweetshine into my coffee. I made it twice, just to make sure it was as good as I thought the first time. Alcohol sells well in fundraising auctions. If it’s legal, put it in your silent auction, live auction, raffles, whatever makes sense for your event. See the photo of the handmade kahlua? That bottle sold well over its value. At a different auction, a bottle of homemade moonshine sold at 200% of value as soon as guests arrived and spotted it. I might be a wine auctioneer, but today’s tip isn’t just about wine. 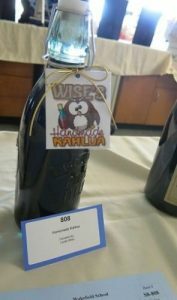 If someone doesn’t know what to donate to your auction, suggest they go make a bottle of handmade kahlua. Or limoncello. Or home brew. Or homemade wine. In most auctions, alcohol sells high.